Thank You For Choosing First Bank of Alabama! Want to join our team? We now have full time teller positions open! Cash handling and customer service experience are required. For more info please contact Anita at aroberts@firstbankal.com. Check Out Our New Checking Products! Ask us how you can Shop Local and Save Local with our new KaChing Accounts powered by BaZing! We are excited to announce that we are expanding into Oxford this summer! Our new location will be at 815 E Hamric Drive. Stay tuned for more updates! Grow your checking account balances with Kasasa! It's the best checking solution for those who prefer to bank electronically. Want more control over your debit card? With Card Valet you are in control. Click the link below for more information. Bank When and Where You Want! Take your banking on the road with Mobile Banking! You can check balances, transfer money and even deposit checks electronically with Mobile Deposit! Want to start making the right decisions for your financial future? We offer financial education courses on a variety of topics to help expand your knowledge and ensure you're making the best financial decisions. Start with the basics! Our General Education course takes you through the fundamentals of your finances for a rock solid financial foundation. No financial skill pays off more than saving money! Our Savings course will help you learn the best ways to save consistently for success. Be smart about lending! Learn about how loans work and when you should and shouldn't depend on a loan for the financing you need. 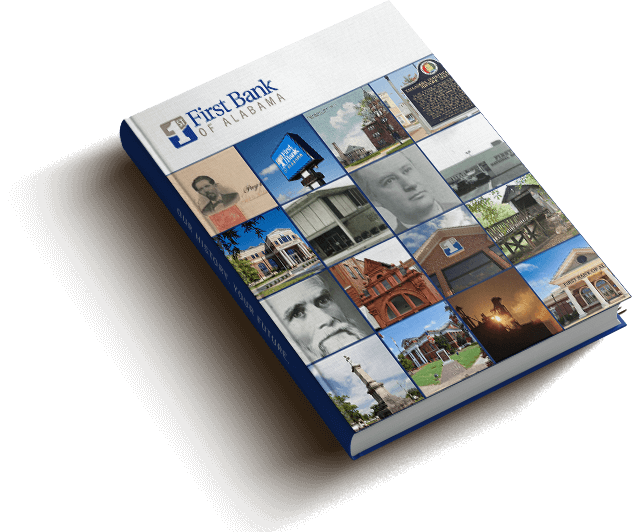 At First Bank of Alabama, we've been creating history since we first opened our doors in 1848. As the oldest continuously operating bank in the state of Alabama, we've seen a lot of change over the years: new products and services, new technology, new buildings and people. The one constant amongst all the change has been our commitment to serving the needs of our customers and communities. We invite you to join us as we continue to create history while building a better future.